At home, cooking can be fun, romantic and relaxing. 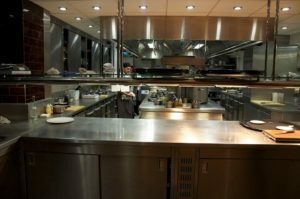 In commercial kitchens, it can become fraught, chaotic and stressful. If it does, creativity and efficiency suffer and valuable staff begin looking for other employment. 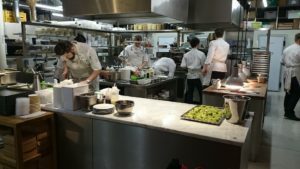 If you believe TV, chefs are ogres who bang everyone into shape by brute force, but the reverse is closer to the truth – a truly competent chef commands a harmonious kitchen. One of the ways to achieve this professionalism is to properly arrange the kitchen itself, starting with a drawn plan (you can see many free examples here https://www.pinterest.com/explore/kitchen-floor-plans/. Plan the kitchen layout to match the business focus. If you produce large numbers of the same items a “conveyor belt” layout makes sense, with the appliances or workstations used arranged in order. The market is awash with yogurt makers, dough kneaders, electric choppers, rice cookers, waffle makers, and too many other gadgets to mention. Some are very good at what they do, but each one takes away more valuable space and adds cleaning and maintenance burdens. They also prevent trainees gaining basic skills. There is no substitute for skill, and with skill, the number of gadgets needed goes down not up. The same is not true when it comes to major commercial appliances and basic kitchenware. For a business, buying the best quality you can afford pays off in the long run. Unlike many modern domestic appliances, quality commercial machinery is less likely to let you down, reduces effort, increases speed, and brings a little fun and pride back into the kitchen. The same goes for basic equipment like knives, spatulas, ladles, whisks and racks – flimsy tools with loose handles just make everyone feel like they’re fighting a losing battle. Quality commercial catering supplies are often available at better prices, and with better customer service, from specialist trade outlets like 247cateringsupplies.co.uk. Even if you have ample space, many operations can be performed more efficiently if equipment is kept closer together, so don’t waste vertical space. Integrated appliances can be designed one above the other, and most pots and tools hung on blank walls above where they’re used. This not only keeps bills down but prevents staff suffering from excessive heat. Locate your refrigerators in the coolest area.